Our building, the Bannockburn Atrium, recently completed its renovations. Building a more modern office building. 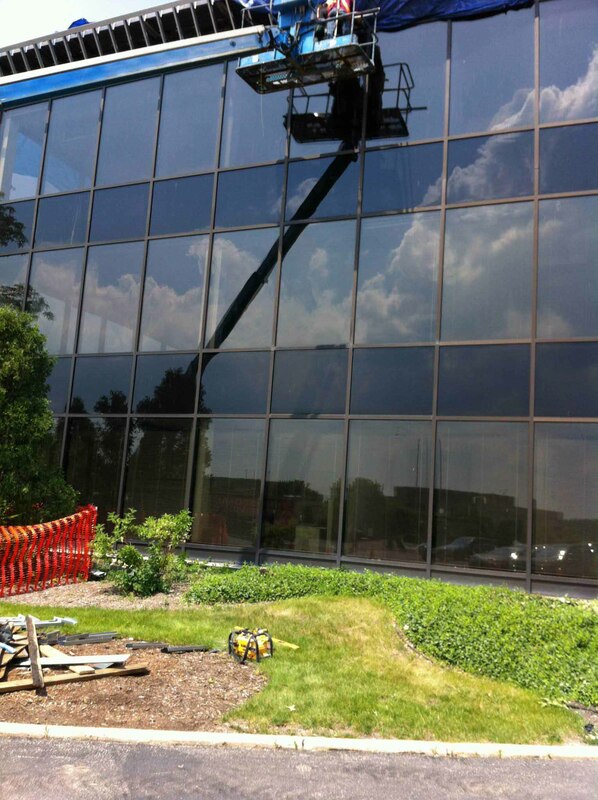 Late last year, our office complex began a major renovations project to change both the interior and exterior look of the Bannockburn Executive Plaza. The Bannockburn Executive Plaza shortly after its construction in 1978. 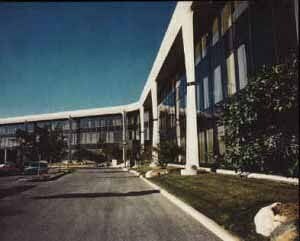 The original atrium at the Bannockburn Executive Plaza. The building, built in 1978, underwent the largest structural changes since its construction. Workers removed the exterior columns, giving the complex a more modern look. Inside, crews redesigned the atrium, placing a new elevator and a fountain in the center of the complex. Crews also brought the building up to municipal code, installing fire suppressant systems and sprinklers in all the offices. 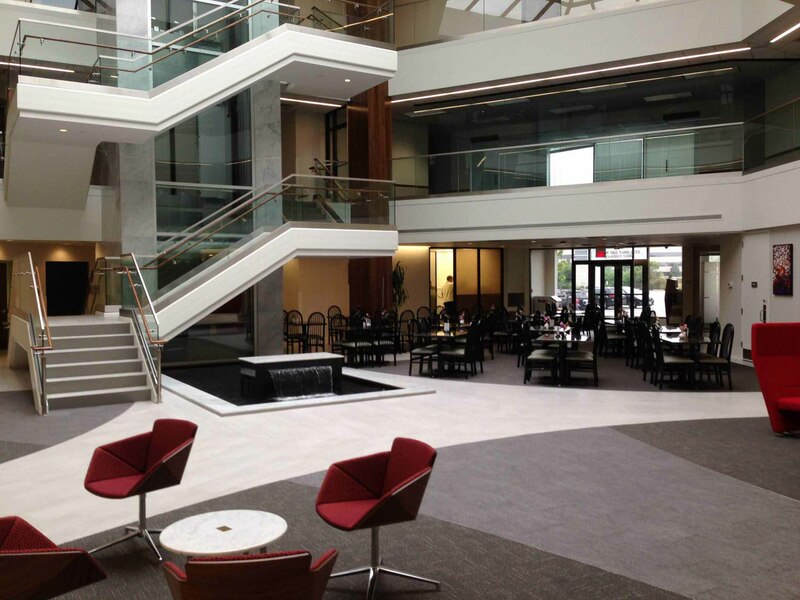 Construction wrapped up this summer, and the newly renamed Bannockburn Atrium opened for business. Our popular restaurant, The Leaf Cafe, re-opened this summer. The restaurant offers a variety of menu items cooked to order, making it a great breakfast and lunch spot for tenants and visitors to the building. 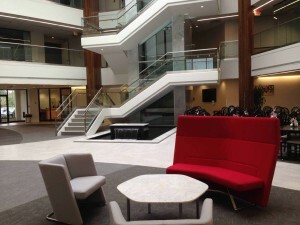 Along with the restaurant, the new atrium offers chairs and couches, perfect for lounging or hosting small meetings. Bring a laptop or tablet and connect to the atrium’s free WiFi. Click here for information about The Leaf Cafe, its menu, and operating hours. Free lunch for your next case. Booking an all-day deposition with us? Ask us about how you can get free lunch at The Leaf on us! Email us at info@lakecookreporting.com or call (847) 236-0773 for more information on this promotion. Stop by and see our renovated complex today! Pictures of the construction and final product. 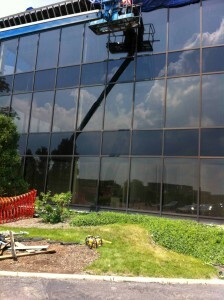 Construction crews work on the exterior design of the building. The Bannockburn Atrium, with The Leaf Cafe in the background. Exterior of the Bannockburn Atrium as seen from Half Day Road and Lakeside Drive. More information on the building and its renovations. Information on the construction can be found at the McShane Construction Company website. More photos of the original construction can be found on the Dolan and Associates website.